After having stayed a bit too long in Mashhad, all though we enjoyed ourselves there with other travellers. A mix of people stayed a the Vail’s guesthouse, cyclists, mongol rally teams, longterm and short-term travellers. We had nice conversations and shared our ideas and experiences. Marion and Brice, a french couple who has also left their jobs and sold most of their possessions (www.en-bourlingue.com), very similar reasons to us, so this meant we could relate to each other and had a good click with each other. Hope we get the chance to meet here in Uzbekistan. We left on the morning of the 21st of august and we had to cross the Turkmen border on the 24th in the morning giving us 3 days to cycle the 200km from Mashhad to Saraks. Leaving Mashhad was quite okay we were somehow extra aware with the accident of David in our minds, quickly we were out of the city and surroundings became sandy and more and more desert like. We had planned on doing some groceries shopping and filling up our fuel bottle on the way out of town and forgot this in the concentration of getting out of town. We luckily found a small shop along the way but again we forgot about our fuel so that night we cooked on a small fire from the desert bushes. Woke up excited/nervous about the coming days as we had gotten info that the border would open at 7am we decided to be there at 6.45 that worked out well and we got into the passengers hall. Only problem was that the actual border guards were not there yet and we had to sit and wait for and hour (cleaned our chains meanwhile) until somebody came and said “you want to go Turkmenistan, give passport!” okay here we go… first we had to go through customs, the man asked each of us to open two bags from the bicycles. He had a look through our stuff, no problems, then of to get a stamp out of Iran that proved more difficult or the guy was just a bit morning cranky.. After 30-45 minutes he finally came back said “Visa Turkey? “ “Visa Ankara” Yes yes we said as we had our visa for Iran made in Ankara, STAMP and goodbye. On to Turkmenistan border control and what a change, mainly very young guys 16-18 years old or maybe younger not sure, into this old soviet style building we were pointed to a closed door, we entered and a man in a white doctors coat was sitting there. Medical check? “Everything okay” yes we said, then we got a thermometer in our arm pits. Out of the medical check. Next stop a young guy to fill in our declaration form, then all of our bags though the X-ray scanner luckily they did not want to have a look at the inside of our bags. After paying 12$ entrance fee we could pack up and enter Turkmenistan! By now it was 10.30 and we were under pressure to get moving. First Susanne could not wait to get rid of the headscarf and then on to Saraghs in Turkmenistan to change money. Martin saw on the GPS if we would just cross the railway we would be directly in Saraghs instead of following the road, so thats what we did not sure we saved a lot of time but at least 7km of cycling.. In Saraghs we exchanged money 60$ at a hardware store 1$ = 2.9Manat okay we were happy and they were as well as the brought 3x 1,5liter bottles of cold water for us 🙂 Some shopping for lunch and of to the desert on the old road (Silk road) see map. 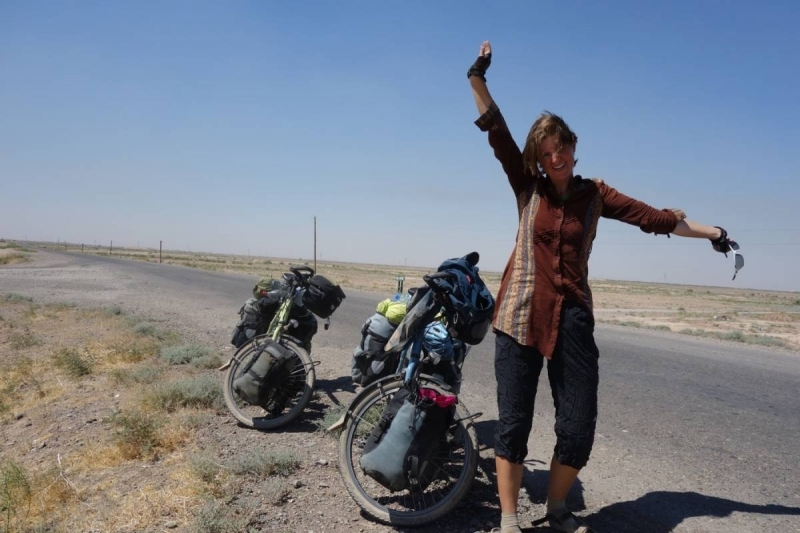 Desert came straight away, a short stop for Susanne to change her outfit away with long pants and on with shorts! Short after we were met by a checkpoint where they noted our passport details and let us continue into no where. By now the wind was starting to arrive we could cycle with around 15km/h until lunch a 13.00 short lunch stop and back on to the road wind was on now and we could push on with 10-12km/h at 19.30 we stopped and camped near an irrigation canal. We were drinking so much so the 3 extra bottles were really a good addition to our water reservoir. We were tired and just cooked, set camp and slept. Before sunrise we would wake up 4.45 start cooking and breaking down our camp, nice and fresh 19c in the morning even wearing jackets. On the road not much wind just a bumpy road the first 10-15 km until we reached khauz-khan a small village with a truck stop where we could refill water, buy some needed items and snack a samso(samsa). Then we were on the main road M37 going to Mary just out of the village we were met by 3 camels or dromedaries as they only have one bump. Martin had a small race with them but they were not up for it and on coming traffic did not appreciate. After this great start we pushed on and reached Mary in the afternoon had a small stop and pushed farther on past Bayramaly where the old ruins of Mari/Merv we did not go and have a look as sun was on it’s way down and we had to find a spot, we pushed on out of town found a spot for the night and were happy with the 130km of the day. Again woke up early felt the last days of pushing it in the legs, no time to worry back on the bikes at sunrise and push on after 10-15km the road turned more north and straight away we felt the wind and more and more wind the whole day we had a strong head wind cycling between 8-12km/h so just pushing on and pushing on. At lunch we stopped at this small cafe/restaurant and a lovely old lady took care of us served a great dish of dumplings and we could rest in the preying room with the Air-con on. Very nice people but we had to push on in to the wind! It was tough and we did not talk a whole lot just cycling stopping every 8-10km to drink as temperatures were still around 38-39c and with a strong wind means drying out fast. We were totally done at sunset and had not reached our goal of 120km just 110km which was okay as we had cycled 130km yesterday. Found a spot in the desert to camp. You got it, on the bikes before sunrise and of course the wind was also already awake only to grow stronger and stronger by the hour and by now we were used to be covered in sand all day. The trucks whip up the sand and it gets blown in our faces by the wind. At the end of the day there is sand everywhere. Not an eventful day just pushing with all we could to get to Turkmenabat. For lunch we were again lucky that there was a truck stop were they served dumplings again. When leaving a tajik truck driver came and gave us a bottle of cola and a bottle of beer our first beer since Mardin in Turkey 2 and half month ago? We reached Turkmenabat in the evening around 18.30 did some groceries for the next leg. Time went fast and we had to make a fast decision to leave the city and camp or find a hotel for the night. We knew that hotels charge 10 times more for tourists so it would be a bit expensive. We decided that it was too late to leave town and went looking for a hotel on the GPS we had the “Turkmenabat Myhmanhanasy” hotel we went there but they were full for the night, the receptionist said that we could try a hotel just behind this hotel. We went there and found a good old run down ex-soviet hotel got a room 30$ okay it was worth 5$ but we needed a place to sleep so not much to do and we checked in. Cooked our own food in the room and went to sleep as we were done for the day! We were happy but did not say anything to each other as we still needed to cross to border controls notorious of being strict and complicated. First we cycled out of Turkmenabat a few check points with no interest in us, we reached the town/village Farap used some of our manats on groceries as we did not know for sure how much there would be on the Uzbek side. After small 3 hours of cycling still head wind and a good heat we reached the border nothing around just a border in the desert. First Turkmen customs all our bags were checked and questions were asked no clue what they were looking for?? We think they were just enjoying them selves having a look what kind of thing we westerners would carry on a bicycle?? But hey you guys get cyclist coming through here every week or not? We thought but did not ask! Got our exit stamp. On to Uzbekistan an unreal feeling as this is a country so distant to us. We were met by guards looking more professional then the turkmen but only for short as we entered the Uzbek border post the first guard asked for money? What, Martin said and the guard said “Go”?? Okay straight away we got our stamp and the customs check which uncontrolled and slow. Martins bags through the scanner but they where to lazy to have the bags of Susanne as well so they only asked for medicine and we said well only antibiotics anyway we needed to show what we were carrying and they where asking what it was. Finally no problems and we were in Uzbekistan! From the border we cycled a bit stopped 2 hours for lunch and a sleep no more time stress 🙂 cycled another 45km and camped in the desert, in Uzbekistan if found out that we have been camping they can deport us from the country so we will only camp 1/3 of the time here and stay in the hotels/guest houses rest of the time. Next day we cycled 60km to Bukhara an ancient town which were at it greatest while the silk road were blooming with silk,spices, gold a magic places to cycle into. Now we have been staying in Bukhara for some days it is quite touristic here an busses of tourist arrive every day, anyway when you walk away from the main sights you can get a feeling of the old city. Then bad luck struck the yesterday 31 of Aug where Martin woke up early in the morning with a strong stomach pain and more or less stayed on the toilet the rest of the day…. We were told today that it might have been a warm water melon we were eating the day before, new to us will have to watch out. Today Martin is already a bit better and we hope to be back on the road soon as possible. Samarkand is our next big stop here in Uzbekistan. Wow, wat zijn jullie al ver! Enjoy de rust na het harde werken in turkmenistan!